I'm currently seting up a SCUMMVM instance. I send the sound signal to a real Roland MT-32 device (via midi). Natively (and via dosbox) you get nice little messages on the display of the machine. For example, before Monkey2 begins you can read "Lucasfilm games". With SCUMMVM, all messages are replaced with "SCUMMVM 2.0.0". Is there a way to get the original message on the MT-32 display with SCUMMVM ? What could I do ? I would suggest testing with earlier stable releases of ScummVM i.e. 1.0.0 and see if this is a recent regression. Those messages are set by MIDI SysEx messages which are dependent on the game, game engine and backend driver down through SDL / native MIDI driver and USB to MIDI interface. 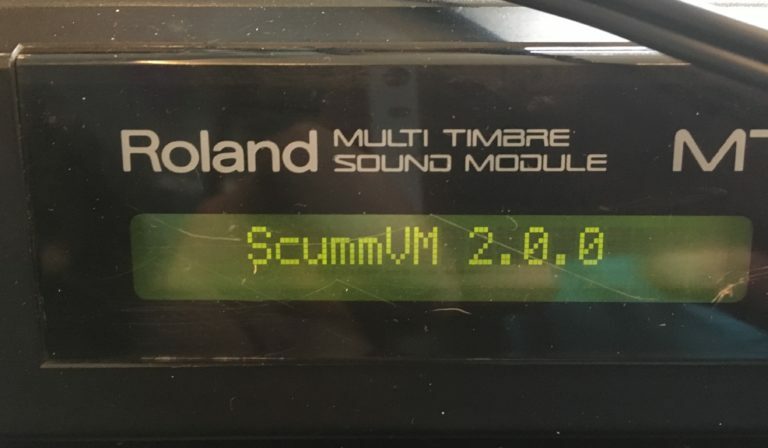 I am not sure where we send "SCUMMVM 2.0.0" as I can't locate that in the relevant backend MIDI or audio code nor the engine code for SCUMM games so it may be the default set by the native MIDI driver based on the Window ID of the source program or something. I would assume you are using Windows? We would need a lot more detail i.e. OS version, USB-MIDI cable type to begin to try to track down why this occurs. I think this does work as the "INSERT BUCKAZOID" message is emitted from Space Quest III using the SCI engine. I do use Windows 10 Pro. To plug the MT-32 (old, no jack on the back) I use a "Behringer U-PHORIA UMC204HD". It is a USB audio interface. I mainly use it to record Microphones with XLR cables and it happens to have what seems to be a solid MIDI Out. Basically it goes like PC > USB midi interface > MT-32 > Speakers. I use ScummVM 2.0.0 (it did the same with an old 1.4.1 version I had at first). I tryed version 1.0.0 found on github and got "SCUMMVM 1.0.0" on the screen. I tested with monkey2. It is interesting that it works with Space Quest 3 though. Hmm. Well, not surprising as internally ScummVM is not a single engine, but a collection of reimplemented engines for various games. SCI which is used for Space Quest 3 sends the required SysEx data to the MT-32 to get that message. Which games do not show the same messages? I assume mainly Monkey2 and other SCUMM games. This is probably as that functionality was not duplicated compared to the original interpreter since this does not appear to be a recent regression. Larry 3 : Both Original messages at the begining and the joke when you exit. I am still amazed by the fact that you can have MT-32 music, sound effects and voices at the same time ! This is why I use SCUMMVM. If Lucas games do not display the right message, it is a fair price to pay and I don't think I can ask for a better solution. Thank you again for digging into that. I hope this post will help or at least inform others in the future.